Yesterday, I went for a little adventure with Joe (Well, I dragged him along with me) to see the City in Bloom. 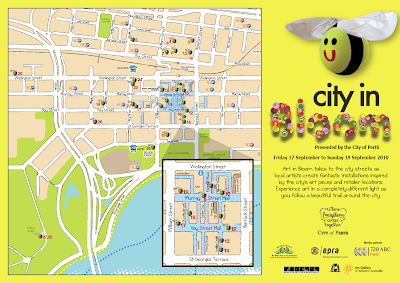 It was presented by the City of Perth 17 Sept to 19 Sept 2010. Art in Bloom takes to the city streets as local artist create fantastic installations inspired by the city's art pieces and retailer locations. Experience art in a completely different light as you follow a beautiful trail around the city. I knew this on Friday and told myself to go for a lil adventure/exercise. I have planned to photograph every single installations, 28 of them. Lucky to have Joe with me, he is the one with the map and I'm the one with the camera. If I do this by myself, I probably need a whole day to finish! It's quite tiring because it's all walking! Okay, let's go through it according to the list above yea..! I only manage to take photo at the outside area because I was quite tired by the time (after 4 hours of walking and photograph everything) So I didn't manage to go in to see the exhibition. The lotus flowers merge Eastern and Western cultural symbols and icons to explore the ongoing, multidirectional flow of cultural traffic we encounter in everyday life. Sally hopes that through interacting with the lotus flowers we can be mindful of the importance of sharing interchanges between different cultures and people. They didn't manage to exhibit theirs. So, no photo. A softer side to street art, Captain Plaknik and Thimbles and Soup have 'yarn bombed' the Piazza Green Wall. They ahve hand crocheted the vines and flowers which crawl up the stainless steel planter boxes. Using the fairy tale Jack and Jill as inspiration, Rose and Kirsty's installation looks at the absurd notion of trying to make flowers grow with a pale of oil. 7. The Urban Orchard by Clement Meadmore and Monique Wajon. Monique has drawn inspiration from the sense of balance of the Meadmore Sculpture to create a tree like sculpture. Six small worlds rest on the platforms of her tree's brances. Students from Central Institute of Technology have created a range of hand made cushions to line the columns of Forrest Chase. Some of the cushions have seedlings planted inside them, illustrating the students ideas of spring in the city. Budgietopia tells the story of two budgies, Reggie and Rose, who flew to the city in search of a place where they could create the wonderland Budgietopia they'd always dreamed of. 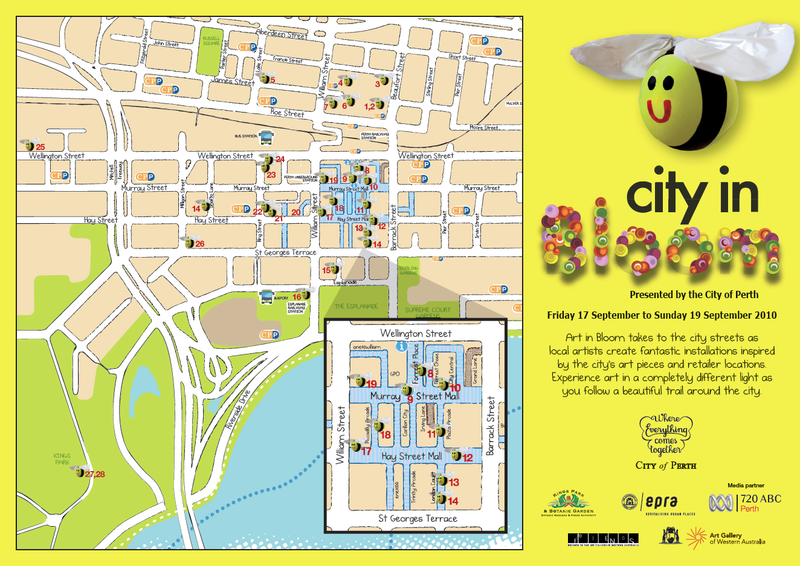 Around 1,000 budgies are calling the i-City Kiosk home for the weekend. Didn't manage to put up. Bloody hell, Joe and I walking in and out, up and down looking for the installation. We gave up and went to the i-City Kiosk and asked them. Turns out that Myer didn't put up the installation. ARgghhh.. waste my energy! Lush have used recycled paper, pots, chicken wire, bubble wrap and soaps to create a large sculpture inspired by Perth Spring time. A huge dragon hanging in the air holding a bouquet of flower. I didn't manage to find the explaination of the installation. Perhaps someone can tell me? The Pigeonhole installation focuses on the idea of Spring as a time of growth. Delicate white origami blossoms run havoc, growing wildly out of the clean, white empty frames that are suspended in mid-air. The window display has a minimalistic, surreal feel; utilising negative space and white objects. The white frames, from which the lovely blooms emerge, also act as 'window within windows' that frame particylar Pigeonhole products. Elizabeth has used plywood, hessian, sticks, wax, dried flowers, fresh flowers, nuts and wire to create a replica of the Judith Anketell Sculpture. Talented Perth dancers Serena Chalker and Guindell Orton from Anything is Valid Dance Theatre have create this fun snail like character using native Australian plants. The snail is made from Australia Bush Chrismas, 24 Sanndgropper potter colour flowers and river pebbles. Denise has used polypropylene strapping, cable ties, plastic utensils and MDF to create giant hanging flowers. Yes.. I forgot to take a photo of the meaning of this installation again..
Simone and Robi have suspended floral and synthetic flowers amongst mixed to created this unique installation in one of the city's newest centres. Elegant design of Classic Cymbidium orchids and twisted willow. Joanna has created delicate flowers from the pages of books to be displayed in the window of Boffins. This installation embodies growth suspended in moment and time. The suspended floral arrangement is de-void of an earthing base. The arrangement appears as a blooming microcosm floating in space. The windows of the stores have been transformed with projections and image of large scale flowers, alongside live flowers and plants. Natalie has created a large human sized cocoon fastened around a cane swing. The elaborate machinery is made with recycled clothes. Take the time to explore the intricates of a mini garden created from pre-loved items around the Conic Fugue sculpture. Manage to ask Joe stop a side and let me take a photo of it. Which is the one above. 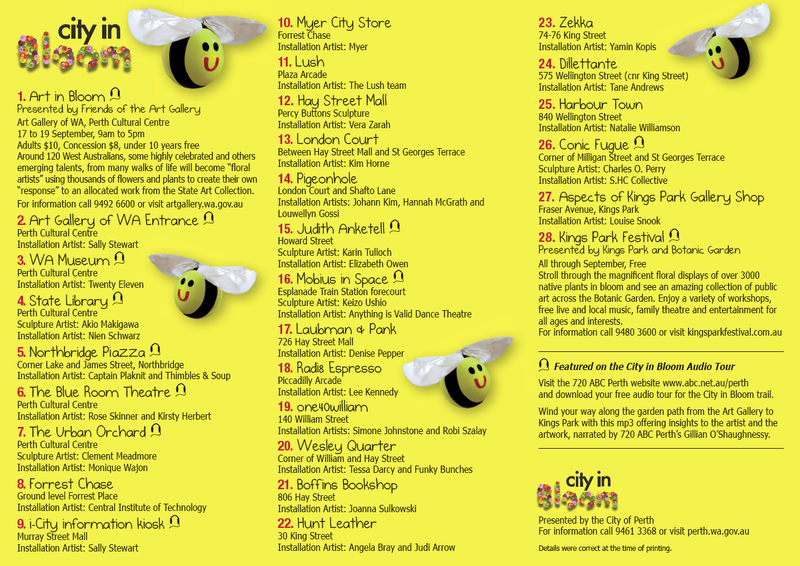 This is the complete record of City in Bloom. Took me 4 and half hours of walking to finish. We were both exhausted walking around the city. While we were half way through.. Joe asked me what have I learnt in the process... I told him "We should get fitter, get a better pair of walking shoes, and I want to sit down!!" He then give me the -_-" face. Remember there's one Installation with lots of pillows on the pillars? I was just telling Joe that I wonder how many drunken or homeless people will sleep here or maybe take the pillow and use it to sleep. Turns out.. they did use the pillow and I found them in a few places while I'm walking around the city taking photos. hey thanks! need to practice more! wah! what an effort! I didnt get to see all, some i couldnt spot, no time (esp Myer -cheat ppl one..lol)but I really enjoyed reading this post detailling all the installations! lovely! and i happened to stumble upon ur blog through browsing for restaurants in Perth! I enjoy reading ur blog...so many places for me to explore after reading ur reviews (i came to perth 6 months ago)friends from SA are coming this weekend, so looking for a place for dinner. Any good food at Northbridge to intro? Thanks! Thanks for stopping by my blog! hehe! I'm still waiting for google to crawl my web add! Google still got my old web address.. -_-"
Oh, Nice meeting you :) yea.. that city in Bloom thing was insane! I don't know what I was thinking that time to take that challenge hahaha.. but its all good. Your fren coming this weekend? how bout stop by PASAR MALAM in COMO on the 2nd Oct? click the link on the right of my blog under Events. What kind of food would you like? you want something funky? traditional? i recommend u to go beaufort st hehehe dinner then yummy dessert! lol! Royal perth show. :)and the moon. i checked the website. so cool. ok...looks like we are going there! hehe. THanks so much! !